I Trust God, Except When I Don’t….? As most of you who are following my blog know, I’ve been reading, praying, and spending time in God’s Word in the book of Psalm lately. Yesterday, I was spending some time in Chapter 119 where it talks a lot about God’s commands, His decrees, His regulations, and laws and how we should rejoice in them all and study, reflect on them, as well as delight in them. 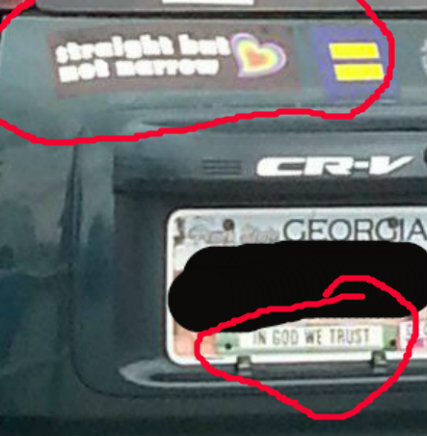 Later in the day, while at work, I happened to notice a car in the parking lot with a tag stating “In God We Trust” and also a bumper sticker saying “straight but not narrow” on that same car. It was like being hit, in a way, with this realization that the person that owns this car is stating that they trust in God, but that a law He’s given us can make us “narrow minded” if we decide to obey, rejoice, or delight in all of His laws. Honestly, it made me sad. Sad, because I know so many other people that feel the same way about all sorts of God’s laws and commandments. He gave us His laws to help us, not to hurt us, but so many people feel that they somehow know better than their Creator does as to what is best for them. I have tried hard to find you- don’t let me wander from your commands. Be good to your servant, that I may live and obey your word. I am always overwhelmed with a desire for your regulations. As Christians and children of the Most High God, children of our Father in Heaven, how can we say that ANY of God’s laws, commands, decrees, are anything but GOOD and PERFECT? Maybe we don’t “LIKE” them all because we’d rather have our own way, just like our children do, but if you trust in Him, then you must TRUST IN HIM. Trust that He is GOOD. Always has been, always will be. After all, anything less means you do not “trust in Him”.